When performing an industry analysis for pitching a strategic recommendation, it is important to perform an analysis of precedent corporate finance activity of major industry competitors to determine the type of transaction that may be most appropriate for the company you are pitching to. Investment bankersWhat do Investment Bankers do?What do Investment Bankers do? Investment bankers can work 100 hours a week performing research, financial modeling & building presentations. Although it features some of the most coveted and financially rewarding positions in the banking industry, investment banking is also one of the most challenging and difficult career paths, Guide to IB will frequently display this information chronologically as a standalone display or integrated with other graphics such as a stock price chartHow to Read Stock ChartsIf you’re going to actively trade stocks as a stock market investor, then you need to know how to read stock charts. Even traders who primarily use fundamental analysis to select stocks to invest in still often use technical analysis of stock price movement to determine specific buy and sell, stock charting. This type of analysis adds an additional layer of depth to key industry themes and provides context for the transaction. The timing of IPOsInitial Public Offering (IPO)An Initial Public Offering (IPO) is the first sale of stocks issued by a company to the public. Prior to an IPO, a company is considered a private company, usually with a small number of investors (founders, friends, families, and business investors such as venture capitalists or angel investors). Learn what an IPO is gives us lots of information regarding the internal and external forces acting on an industry. Companies that are looking to go public will invariably want the highest valuationValuation MethodsWhen valuing a company as a going concern there are three main valuation methods used: DCF analysis, comparable companies, and precedent transactions. These methods of valuation are used in investment banking, equity research, private equity, corporate development, mergers & acquisitions, leveraged buyouts and finance possible for their shares to be issued, as it provides an attractive exit for investors with plenty of choices to mobilize IPO proceeds. A series of IPOs within a relatively short period of time signals to the market that valuations are rich within the industry, the business cycle is nearing a peak, and growth opportunities are attractive. 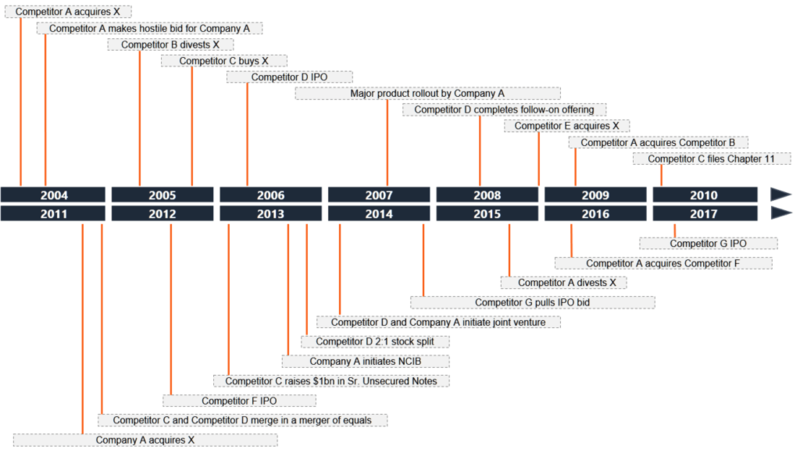 There are waves in IPOs, a phenomenon called “hot issue markets” that are often disproportionally populated with firms in a particular industry, which provide a lot of insight as to the timing of IPOs and the perceived growth trajectory of a particular industry. Conversely, a company may opt to “pull” their IPO if market conditions are not favorable. A recent example of this is Bento Sushi pulling their IPO given the recent turmoil in the consumer discretionary sector and weakness of the Canadian economy, resulting in a low valuation. The types of M&A transactions that competitors perform is crucial to identifying not only industry trends but also the valuation ranges implied in precedent transactions, a valuation analysis that we will discuss further in detail in this series. Regarding industry themes, a company may buy another company if there are strong realizable synergies, diversification opportunities, horizontal integration, vertical integration opportunities and competition considerations. Synergies refer to the cost savings realized from eliminating redundant activities, and an industry where synergy-oriented acquisitions are ramping up indicates that scaling opportunities are abundant. Diversification refers to reducing the company’s overall exposure to a particular type of risk. For example, if companies that produce industrial machinery for construction purposes purchase companies specializing in military equipment, we can infer that these companies possibly have too much customer concentration risk in construction and wish to expand their customer base. Eliminating competition may be another motivation for a firm to acquire, and this trend is often associated with high premiums paid for these types of targets. The biggest insight to be gained from observing capital raisings in an industry is the cost of capital. The capital cost represents the opportunity cost required by investors that can earn a risk-adjusted return by investing in the same asset class. For example, if a particular country is engaged in expansionary monetary policy since interest rates are low, companies will be more motivated to incur debt and pursue transactions, as they can do so cheaply. Equity securities command a higher return than debt since shareholders are lower on the pecking order than creditors if a company was to go out of business and liquidate its assets. Furthermore, there is the risk of diluting existing shareholders. A strong financing mix will optimize the value created by a company pursuing a transaction, whether it is for an M&A transaction or for project financing. In theory, a company’s share value should go up by the NPV amount per share, and the cost of financing is embedded in the discount rate used for these projects. An industry undergoing heavy investment may indicate the existence of attractive growth opportunities. Normal Course Issuer Bids (NCIB), joint ventures, hostile takeovers, divestitures, bankruptcies, and recapitalizations are all examples of corporate finance activities a company can undertake to take advantage of a particular market condition. It is important for an investment banker to recognize the significance of the transaction and the timing considerations. Many of these transactions have both company-specific and industry-wide implications, and it is the investment banker’s job to identify the relevant information that pertains to the company they are pitching to. Corporate finance activity is, therefore, an invaluable part of the story that you will be selling to company management in investment banking.